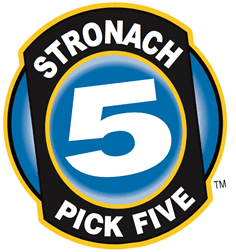 Sixty-nine bettors earned $4,777 Friday for solving the Stronach 5. The day began with an $88,189 carryover. The winning number were; 5/5,7,8,9/5/3/4. This entry was posted in Horseplayers and tagged carryover, Golden Gate, golden gate fields, Handicapping, horseplayers, laurel, laurel park, payout, stronach, stronach 5, Wagering by Press Release. Bookmark the permalink.